Sewing, Programming & Soldering - Crafting with Code 4.2 — Wonderful Idea Co.
We had super busy second day of crafting with code sumer camp experimenting with lots of tools and techniques that we'll be working on during the rest of the week. In the morning the whole group worked on sewing circuits with conductive thread, battery holders and LEDs. There was a lot of struggle to thread the needles, make stitches and set up the components but in the end people made a lot of cool discoveries. I noticed how kids' interests showed up in their projects! We saw creations themed around fornight characters, the deathly hallows and minions. In the morning we also experimented a bit with beetleblocks to get a start with visual programming. There wasn't enough time to do too much experimenting with digital tools but we got to demo the watercolor bot and hopefully tinkerers will continue to mess around with these ideas during the next three days. 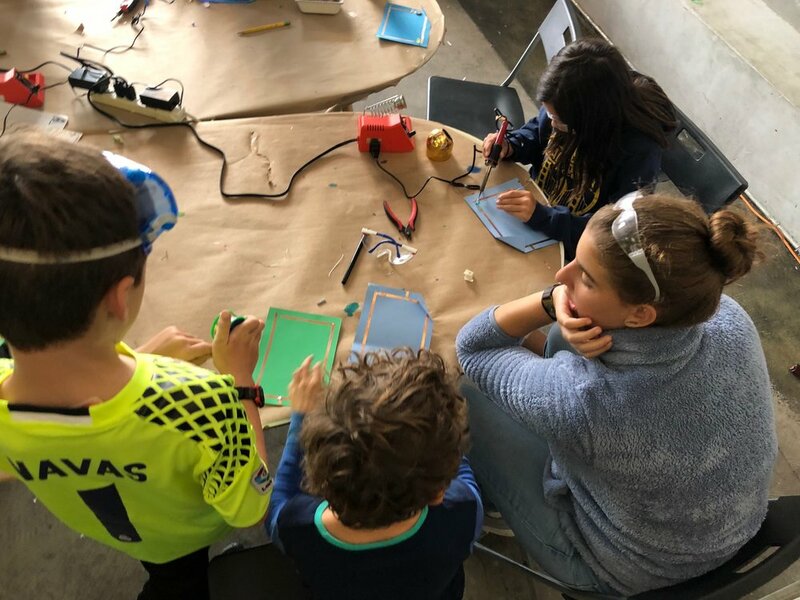 In the afternoon we split into two groups and started investigating programming the Chibitronics Chibichip and learning how to solder paper circuits. These were both new practices for many of the camps and it was important that they had time and space to make mistakes and learn from each other. We worked off a premade template that they brought back and forth between the two stations. We only had a bit of time to try programming the microcontroller and learning how to solder, but there were some interesting work to take things further by exploring multiple LEDs, the RGB neopixel and refining their soldering techniques. Tomorrow we'll continue to explore both of these elements and work on going deeper with both the physical and digital materials.